SAP and Google are running what can best be described as an “X Factor” competition for applications that use both HANA and the Google Cloud. I have been doing the second and third of those options. I just did a technical review of a book on ABAP orientated programming, coming up here in Australia is a HANA code jam, followed by Ariba Live, followed by the Australian SAP User Group conference (where I am speaking), followed by SAP TECHED in Las Vegas (where I am speaking). In addition I volunteered to be a judge on the SAP/Google “intelligent app” contest. You have till the end of July to register. You have to sing a song in front of a panel of judges who cannot see you and then they turn around if they like you … hang on, that’s not correct. In fact you have to build an “intelligent” app using HANA express and the Google Cloud Platform, and it has to be earth shattering. How difficult can that be, so go on, create such a beast. The winners will be announced at SAP TECHED Las Vegas, where I will be, wearing my SAP Mentor shirt, if it (a) arrives and (b) is large enough to be wearable by a human being. That’s a very obscure joke, this year’s Mentor t-shirts, due to a manufacturing error, came out only big enough to be worn by people who are six or seven inches tall, which is not the majority of Mentors. Anyway, let us get back on track – just in case you have not heard of HANA Express, this a version of HANA you can download to your laptop – with no licence fee up to a certain amount of memory. Here in Australia, just before Ariba Live, there is a series of “code jams” in the major cities to try and teach people about this – I am going to one myself. As we all know the benefit of HANA is to not only perform existing tasks at lightning speed, but more importantly to enable totally new tasks that were deemed to be impossible before. I can at this time reveal a sneak peek of the SAP planned roadmap in this area – after “SAP HANA Express” becomes successful, they are planning to launch “SAP HANA Trouser Press” which will be useful if you are in a hotel and need your trousers pressed in a fraction of a second. Now, how would you define what an “intelligent” app actually is? There are as many definitions of what makes a computer program “intelligent” as there are stars in the sky – plus one more. However as that extra definition came from Jock McMad, the Mad Scotsman, winner of the all Scotland mad contest 2017, no-one pays much attention to that one. What do I mean by that? Let me put it another way – in the technology world we have been somewhat spoiled by “Moore’s Law” in that we expect things to become twice as good as they were the year before. That has become the de facto benchmark so if some piece of technology is NOT getting twice as good every year we get all offended, and the manufacturer thinks they had better increase the rate of innovation/improvement or they will be stuffed. 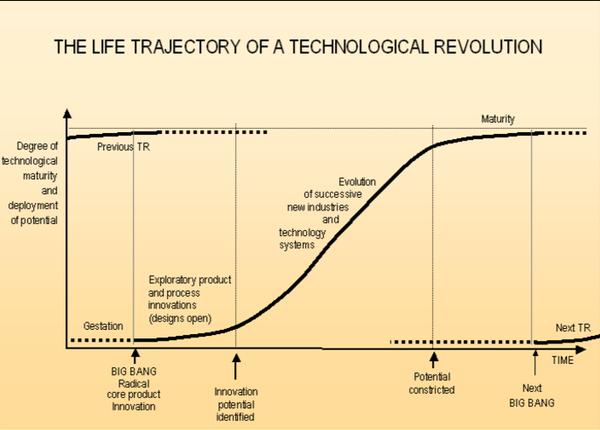 At the start of this blog is a diagram showing the infamous “S Curve” which is supposed to describe every technology innovation thus far. One example might be rockets. The idea has been around for ages, gunpowder was invented a very long time ago, and the idea of propelling things into the air, as well as into people in order to kill them followed soon after. The technology got slightly better very slowly over hundreds of years, and then during the Second World War it went into overdrive, as can be seen on the opening credits of “Star Trek : Enterprise”, and the learning thereof enabled the technology that twenty years later made the moon landings possible. It has to be said the people of London did not think very much of these experiments that improved the rockets. However if a rocket was launched tomorrow to go to the moon, fifty years after the first landing, it would not be that much better, rocket wise, and would take about the time length of time to get there. In other words the S curve of rocket technology was a slow increase over a very long period, followed by a short period of extreme innovation, followed by an almost imperceptible improvement in the following years. This is the S Curve. Thus far it could be argued that almost every technological innovation has followed this pattern – after a while things level off e.g. a flat screen TV might seem to be a big jump, but it is still fundamentally a TV. What about Moore’s law I hear you say? Well, ever since the doubling of computer power every 18 months started, people have been saying that this cannot go on and will stop shortly because of physical constraints. It has not actually stopped as yet, but it could be said this is just a really long stretch of the S curve which is “bound” to level off due to information not being able to travel faster than light and what have you. Many years ago (about 1989) I read an article where a scientist proposed a solution to the upcoming end of Moore’s law (which did not actually end then, and still hasn’t). He noted that the maximum speed of computers was limited by the laws of physics. He therefor proposed building a computer in a universe where the laws of physics did not apply. My best mate described this as the best example of “thinking outside of the box” he had ever encountered. Let us just say, for the sake of argument, that we have in fact come to the end of Moore’s law, and if so, then computer development will have followed the traditional S curve, just at a slower rate than usual. This is the hardware aspect. Software however does not live in the physical world so much, in many ways it is more of an abstract concept, transferred into the real world as a string of ones and zeroes. Going back to the Second World War, in Bletchley Park Alan Turing was already thinking about artificial intelligence in computers, as a means to crack the German Enigma Machines. I don’t think the researchers at Bletchley Park got anywhere near what today’s researchers would consider AI, but they were thinking about it, which is of course the first step to solving any problem. Alan Turing had two notable assistants, polar opposites, one called Jack Good and one called Jack S.
With artificial intelligence, the improvement curve will not be shaped like a letter S, but more like the letter “J” – a very slow start just like a normal S curve, but once the upward trajectory starts, it will never stop and indeed accelerate. You hear a lot about AI and machine learning these days (e.g. SAP Leonardo Mutant Turtle) but you might not be aware this is the third time in recent history (1950+) that people have got all worked up about this. The language LISP came out in the 1950’s for example and that was designed to be self-adapting. However the first two artificial intelligence booms fizzled out (so to say) and there was a “wilderness” period for artificial intelligence researchers each time, where they had to live in caves and survive by grabbing fish out of lakes like mountain bears do. This time though the consensus is “third time is a charm” and almost every company is going crazy trying to add artificial intelligence / machine learning into their software systems. It looks like this time, it’s here to stay. So, not to worry you too much, but it looks like before you know it machine intelligences will be able to do any job better than a human, and we will all lose our jobs, and starve to death, and that is the end of civilisation as we know it. On the bright side, at least it is not raining. On a more prosaic note I follow the “Robot Olympics” every year, and no matter how “intelligent” the mind behind the robot is, it is going to need to do things like be able to get out of a car, or walk along an uneven surface without falling over, something the current wave of robots are finding an insurmountable obstacle. A journalist watching the contest – which involved driving and parking a car (easy), getting out of the car (virtually impossible), walking up the driveway (medium), opening the door (difficult), walking across a rock strewn floor without falling over (virtually impossible), cracking the safe on the wall (easy) opening the safe (very difficult), taking out the contents (very difficult) and the retracing the journey. As can be seen what a human finds tricky (such as driving a car, or cracking a safe) a robot finds easy and things a human finds easy (getting out of a car) a robot cannot currently do. At this point I bet you are saying “a human finds it easy to drive a car” but if that is true, how does it explain the driving behaviour I see in Sydney every day? Getting things back into perspective for a moment, every big innovation has been called out for being the end of the world, for example Socrates did not think much of the new idea of writing things down as he reasoned that this would mean you did not have to remember as much, so your memories would not be much good any more. I myself have to write down every “SAP is broken, fix it” request I get (by phone or in person) otherwise I will forget it so he was right. Realistically we are still at the stage where there are so many convoluted difficult processes humans have to go through – be it in their private or business lives – so that the world is in fact crying out for “intelligent applications”, which brings as right back to the SAP/Google “intelligent app” contest, after a massive bit of waffling about the nature and history of artificial intelligence. I find it difficult to believe that creating such solutions using HANA Express is going to cause civilisation as we know it to end, so as a result I cannot wait to see the entries in this competition! As I mentioned I am a Judge for this competition. Judge Dredd would say “I’m Judge Dredd and you creeps are under arrest”. Judge Project Manager would say “I’m Judge Project Manage and you creeps are under budget and on time”. I am going to say “I’m Judge Mentor Number 180 and you creeps are HANA Express and the Google Cloud Platform”. I liked the way you have framed the article, its magnetic, A very well adoption of S cure in writing the article :-). First you are out of your mind! How many things to you have going at once? It makes me tired just thinking of it. As for robots and being stopped by the easy things we do. Who says an AI has to look like a human? The military is already using them. They can move over different terrian. We are automating our cars now. So would it be so hard to add AI to the cars themselves? One AI moves another one to a different place. We have Drones – what could we do with them. We are probably doing more things than I have ever thought of. It’s coming. We have to be ready to adapt. However, we humans adapt easily. Absolutely, we don’t need to anthropomorphize our AI and assume it will be in a robot body. In all likelihood, “general” or “strong” AI is just as likely to emerge in a virtual environment which, as Paul suggests, might as well be another universe where our laws of physics do not apply. Rock-strewn driveway to negotiate? Simply delete the rock objects! Paul, thank you for another tremendous blog! Personally I’ll believe in AI when Siri will start understanding my accent and putting all kind of nonsense on the shopping list. The Singularity is Near! I, for one, look forward to meeting our new AI overlords… who may or may not look like robots. I had not noticed that, but checking the website again you are quite correct. I have made inquiries as to the logic behind this. There must be a reason – 95% of the worlds population live outside of the United States, so that would seem to restrict the pool of possible applicants somewhat. After all, it could be argued that SAP was not invented in America, nor HANA, and those are both fairly innovative things. Also I was at my most inventive when I was fourteen. Computers had only just become available to the “masses” in the UK in 1981, and looking back I am amazed what I achieved with only 1K of memory to work with. One of my peers even wrote a chess game – in 1K! You could only have about four or five pieces and do the end game, but the rules as to how the various pieces moved were all there – all in 1K of code. These days an email auto-signature takes 16K. At that point I had also been told it was “impossible” to get text compression down to below 50%, so of course I was hell bent on breaking that barrier. I have no doubt that poor old SAP and Google have lots of red tape legal type rules to deal with which imposes this restriction upon them – and those are the sort of rules that stifle the very innovation this sort of contest is seeking to promote! SAP and Google agree that innovation can come from a diversity of people including various ages and locations. To roll out this challenge globally would have taken much longer to organize, hence it was decided to limit the program. Please note, employees from US regional offices of international companies may participate. Clearly there is some sort of technical/legal barrier to opening up an online contest to the entire world. If it is a legal problem, there is nothing that can be done, If it is a technical problem, maybe contests like this can find a way to break down the barrier. It did occur to me that a really clever fourteen year old from anywhere in the world could no doubt hack the system so they appear to be an adult from the USA!